Max Verstappen says Sebastian Vettel was the main driver at fault for the Singapore Grand Prix Formula 1 start crash. 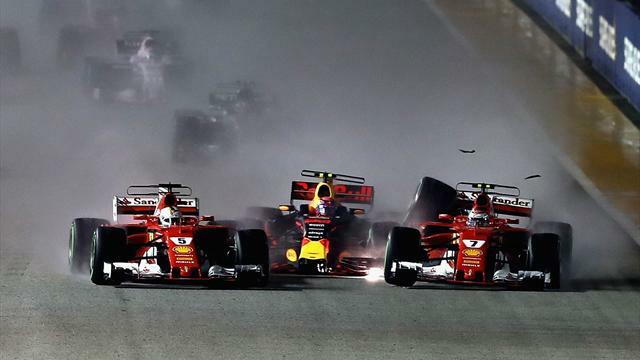 Verstappen was pinched between the Ferraris of Vettel and Kimi Raikkonen on the run to the first corner, causing all three cars to collide and resulting in a secondary incident that also collected Fernando Alonso. While Vettel avoided that second impact at Turn 1, his car was damaged and he crashed out moments later from the lead of the race. Vettel said he didn't know what happened to cause the accident, but Verstappen felt the German was at fault. When asked by TV crews who was to blame for the crash, Verstappen said: "Mainly Sebastian. He started squeezing me, maybe he didn't see Kimi on the left. "That's not an excuse - if you're fighting for the world championship, you shouldn't take those risks to squeeze someone that much. What does he expect? When you're fighting for a world championship you shouldn't do that. It was not very clever. I don't think it was a racing incident. At the end of the day, they take in total three cars out." Verstappen said he tried to avoid the incident, but there was nothing he could do. "I tried to back out of it because I could see it coming, but the rear tyres are wider than the front so I couldn't back out of it anymore," he added. "I was in the middle without doing anything wrong, I was just trying to have a clean start. I'm happy that not only I retired, but all three of us, so we all have a bit of pain. If I make a mistake myself and go off, that's a different story. "I could see Kimi had a great start so I tried not to defend that as it's a long race but after 200 metres everything was done." Raikkonen added: "I don't think I could have done anything to change the end result apart from doing a bad start and not being there. "That's not really my fault. Whatever the cause of the accident is, it doesn't change the end result. There are always different views, but I don't think I could have done anything different. The FIA said it will investigate the accident after the race.